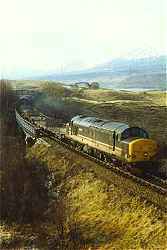 The line is also known as "The West Highland line". This map is clickable, click on stations or other lines for their details. Loch Tulla and Blackmount in background. The West Highland line branches off the former Glasgow, Dumbarton and Helensburgh Railway at Craigendoran. There is a loop provided here on the West Highland route. Also at this point the Helensburgh Railway drops from double track to single. 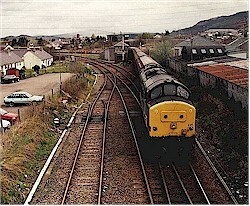 There were high level platforms for the West Highland route at Craigendoran station. This island platform station formerly had a passing loop, but today it is single track. The loop was lengthened in the Second World War. The original station building here has been demolished but a shelter has been provided. This station was unusual for the West Highland having two platforms. It is closed today but the two concrete platforms remain in place with the now single track slewed between them. The Military Port No 1 railway left the West Highland here and ran down to Faslane where a large military harbour was established, along with the branch, in the Second World War. The branch remained in use after the war for the scrapping for ships but was lifted in the 1980s. This island platform station has been closed and the line singled. The station was a typical West Highland style station. The stationmaster's house remains and the former widening of the trackbed is obvious. This island platform station remains open. The original station building, signalbox and a parcels building remain standing. There is the pit of a former turntable here. This was a single platform station built to serve Portincaple. It was built to a non standard design for the line and no trace now remains except some fencing. This station is open. The original station building has been demolished but a small shelter, in the style of a West Highland signalbox has been built. The original signalbox also remains. There are sidings here, sometime used for timber loading. This station, passing loop and sidings were built in 1945 in connection with the construction of the Loch Sloy Hydroscheme. The station, loop and sidings are now closed. This station is open. The original station building has been demolished the signalbox remains in use as a waiting room. The loop here is still in place round the island platform and some sidings, used for permanent way trains, remain. This station is open. Although the original station building is now gone in recent years a smaller West Highland style building has been built at the south end of the platform. At the north end the original signalbox and tearoom building remain standing. (This tearoom is open today and is worth a visit!) In times past the tearoom provided lunch-baskets to the trains halting here. The locomotive shed renains here and is today used as a base for maintaining the permanent way. This station is open. The original station building still stands, the passing loop remains in use and there is a short maintenance siding (the former reversing spur for the now closed goods yard). This station is open. The original station building still stands (in use as a bunkhouse), the passing loop remains in use and there are two sidings. This station is closed. It was established as a passing loop to break the long single track section. The station here was rather isolated (there was no road to it) and a grounded coach body existed on the island platform, by the signalbox, used as a schoolhouse for the children of the local shepherds. The loop was removed and later re-instated but the station is not open to passengers. The loop is operated by groundframes. This station is open. The station building and signalbox remain standing. The platform is access by a footbridge (the footbridge was removed in the 1980s when it was replaced by a level crossing footway, now replaced by a new bridge). A new building has been erected over the entry to the footbridge in a form of West Highland style. At the north end of the station is a memorial, made by the navvies who built the railway, to Mr Renton who used his personal fortune to pay for completion of the line when the company ran out of money. 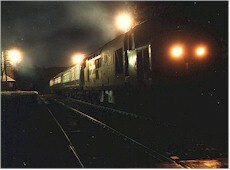 A camping coach siding existed to the east of the station with a turntable. Camping coaches remain here, but the siding is lifted. Permanent Way sidings exist to the west side of the station. To the north is a substancial viaduct at the start of the climb to Corrour. This station is open. The station has an island platform and former signalbox (sometimes available as a bunkhouse - present circumstances unknown). The former stationmaster's house has been re-built as a summer tearoom. The station waiting room is somewhat rudimentary, lacking a door which can make waiting here an experience in the middle of winter. The highest point on the line is just to the north of the station. The passing loop here is operated by ground frames. This halt is closed. It was used during the construction of the dams on Loch Treig and the Laggan Dam. These were built for the hydroscheme built in connection with the Lochaber Aluminium Works at Fort William and had their own railway, the Lochaber Narrow Gauge Railway. This short branch and sidings were used during the construction of the dams on Loch Treig and the Laggan Dam. These were built for the hydroscheme built in connection with the Lochaber Aluminium Works at Fort William and had their own railway, the Lochaber Narrow Gauge Railway. This station is open. It is unusual for the West Highland having two platforms. The station building and signalbox remain standing, the main building in use as a hostel. A short siding is used for maintenance, the former reversing spur for the goods yard. This station is open. It was unusual for the West Highland having two platforms. The passing loop here has been lifted and the southbound platform is now out of use, all trains calling at the former northbound platform. The station building has been demolished and a shelter provided. This station is open. It has two platforms and the station building and modern(ish) signalbox remain standing. The station building is now in use as a restaurant and the signalbox is used as a bothy for railwaymen. This station was the junction for the Invergarry and Fort Augustus Railway which had its own station building (now demolished/removed) used for a time, as a post office. This was located to the west of the road overbridge as was the bay platform for the Fort Augustus trains. The junction here was a surprisingly complex double track affair and there was an engine shed for the branch trains. The station is in excellent condition, having been "adopted" and beautified with many garden plants. The alumiunium wortks in Fort William is rail served. It currently receives bauxite by rail. Although the aluminium produced does not travel by rail at present it has for much of the works existence. The Lochaber Narrow Gauge Railway also served the works. This is the junction between the lines from Glasgow and Mallaig. It was originally Banavie Junction (for the short Banavie (Pier) Branch, renamed Mallaig Junction (when the Mallaig Extension opened) and has in recent years been renamed Fort William Junction to avoid confusion about its location. A signalbox remains open here and closer to the Fort William station are oil sidings which currently (2011) receive an oil train once a week. This is the terminus of the line and station in Fort William. This is a new station which was built in the 1970s when the line was cut back from the original station by the Macbrayne's pier. The station is close to the site of the original, and now closed, goods yard and engine shed. There is interchange with a bus station here, carparks and supermarkets. An underpass under the main road takes passengers through to the town. The original terminus was closed in the 1970s when it was replaced. This was located at the Macbrayne Pier (now a fish restaurant on the other side of the main road from the town). It was thought unfortunate that the town was separated from the waterfront by the railway in the past, now they separated by a dual carriage way. This station had canopies over the three platforms (two bay and one which ran a short distance past for pier parcel traffic). Nothing remains today except the Macbrayne's building. This yard was established in wartime at the junction between the Mallaig and Glasgow routes. Looped sidings were installed on the Mallaig line. This was later extended with further sidings and a turntable. On closure of the original engine shed these were used as the approach for the new engine shed at Tom-na-Faire. This engine shed, carriage sidings and goods sidings were established in the 1970s when the original shed and goods yard closed. 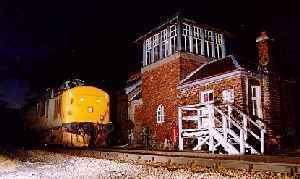 The yard plays host to the summer-only steam engines and a coaling depot is established here. This former junction, the second to bear this name, was the junction between the original Banavie Pier branch and the Mallaig Extension Railway. It is no longer a junction but the trackbed of the former Banavie branch can just no more be seen as a low embankment running east from the Mallaig line. This was the terminus of the short branch from Fort William which served the Caledonian Canal (a goods siding reached this by reveral). The station building remains in use as a house.